The “artist weaver” concept has its roots in the idealized concept of the craftsman advocated in the German Bauhaus movement, and first articulated in Finland by industrial designer Arttu Brummer, Anttila’s husband. Brummer was appointed to the faculty of the Central School of Applied Arts in Helsinki in 1919, two years after Finland’s independence from Russia. For him, the Bauhaus represented a symbolic link to Europe. Eager to forge international ties, he made numerous trips abroad. During a trip to Gothenburg in 1923, he observed “In the same way as Sweden, we should explore all the possibilities that are provided by the technique in the art of weaving…” and in a 1924 article on the Finnish handcrafts industry, he reported that several Finnish artists “…had in particular at the loom found new possibilities and expressions for their artistic aspirations.” He was likely referring to Anttila, whom he had married the year before. Trained as both a painter and a weaver, Antilla was eager to engage new models of artistic practice. 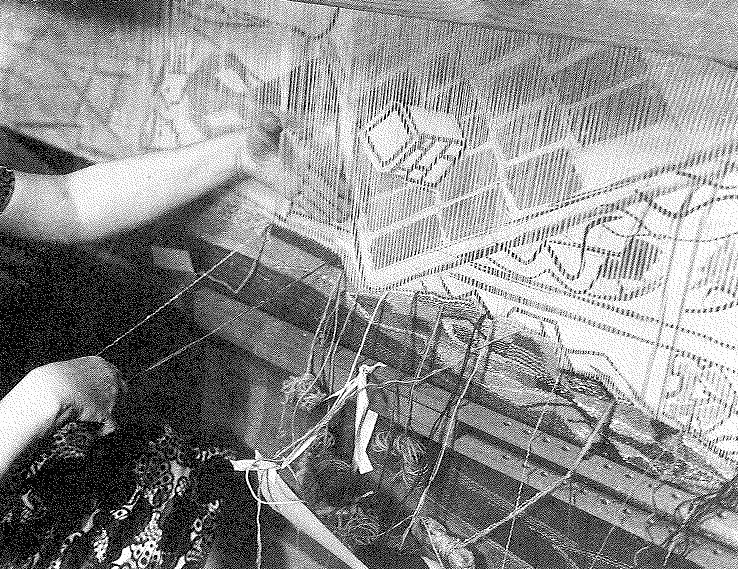 Photographs show her weaving with a working drawing behind her warp, but the weft pattern often appears to take on dimensions of its own. Indeed, Anttila’s goal was not to copy the drawing. It was to interpret it though what Bauhaus textile artist Anni Albers would later describe as the “grain and gloss, smoothness, roughness, the relief quality” of the textile surface. With its strong vertical rhythm and stippled shading, Evening echoes these ideas, demonstrating Anttila’s sensitivity to the aesthetics of the woven structure. Mae Colburn is a graduate student in the History of Decorative Arts and Design program at Parsons the New School for Design. Her focus is textiles. Kirsti Salo-Mattila, “Picture vs. Weave: Eva Anttila’s Tapestry Art in the Continuum of the Genre” (PhD diss., University of Helsinki, 1997): 61. Kirsti Salo-Mattila, “Picture vs. Weave: Eva Anttila’s Tapestry Art in the Continuum of the Genre” (PhD diss., University of Helsinki, 1997): 32. Anni Albers, On Weaving (Middletown, Conn.: Wesleyan University Press, 1965): 64. I believe I have an Eva Antilla hanging from a great aunt (passed away in 1985) who studied weaving in Europe possibly in the 1940’s. Not sure. Haven’t looked at it in years and hope it is not full of holes. Growing up and visiting our relative we always thought it was a whale. If in good shape and is the real thing, what can I do with it? I can send a picture from my cell phone.